Ambra sits on the north coast, less than 100 miles from the north-western fringe of Davokar, where the trees literally tumble into the ocean. The grey churn of the ocean shrouds small island outcrops and jagged teeth of serrated rock, making travel by boat foolhardy at best. What little research the Ordo Septimus could manage, before the storm, suggested that the same process of dungenesis that periodically impaled the landscape north of the Titans seemed likely responsible for this hazardous phenomena. Grasslands, dotted with small lakes and resilient copses of iron trees, form the bulk of the landscape running all the way to the Inner Sea some 500-miles to the west. Nothing steeper than low hills shelters the land from the weather than sweeps in from the great expanse of water. In principle, the conditions make much of the land arable, but the weather is not the enemy of the farmer here. Sat in the middle of the great swathe of land west of Davokar lies the brooding fortress of the Blood Daughter; around the fortress the many roving bands of the Saar-Kahn scythe across the open land, sometimes mounted, often on foot. They prowl and prey upon any intruders into their expansive domain, no matter the cause or allegiance. Of all the barbarian tribes, the Saar-Kahn are the most enigmatic and certainly the most dangerous. However, they’re not foolhardy; the Saar-Kahn have limits and locations that they consider taboo, more often than not because the danger outweighs any benefit of their presence. They would think twice before venturing into many areas: the bramble-trap of north Davokar, the clashing rocks of the Skräll Vägg, and, perhaps most telling, the settlement of Ambra itself. I had come at last to the ancient sea town where my people had dwelt and kept festival in the elder time when festival was forbidden… Mine were an old people, and were old even when this land was settled… years before. And they were strange… and now they were scattered, and shared only the rituals of mysteries that none living could understand. 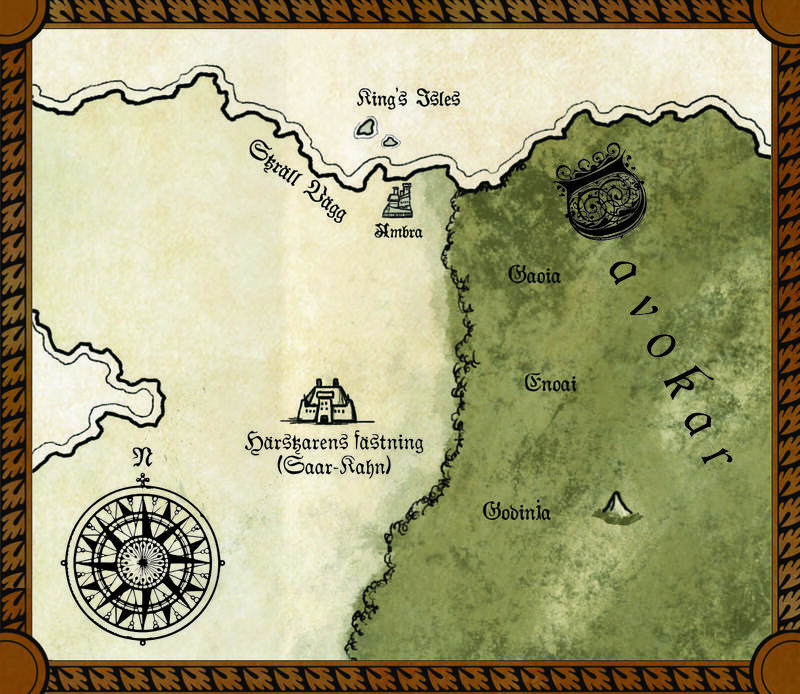 Truth be known, the sorcerers of the Symbaroum Empire were not the first, nor the last, to meddle with powers and concepts that outstripped their understanding. A delicate balance that exists within the world, and the Empire tore down the barriers and traversed the boundaries with such indifference and abandoned they threatened everything. Only the actions of the alliance of humans, elves and others, now known as The Iron Pact, managed to stem the tide and suture the wound; but, in the elder times, dark furtive folk, now almost lost to all memory, shredded the paper-thin walls of existence in pursuit of their dreams. The Elder Ones gave voice to Wratha in furthering their cause, harnessing the rage in wild hunts, savage battle, and grotesque acts of celebration — little more than thinly disguised acts of ritualised sacrifice. They ravaged everything to fuel their excesses, leaving them and the landscape twisted and corrupt. Wishing to further their society, they passed on their primal secrets from father to son, ritual becoming festival, sacrifice becoming devotion. The Elder Ones achieved this by transcended this world, this scrap of tattered parchment called reality, even to the extent of giving up a measure of their humanity (though they were never human to begin with!). By separating their sybaritism and wanton destruction from the real world, they hoped to extend their rule indefinitely. But, like sodden parchment in a storm, the material of the world began to leak as the excesses of Wratha seeped through. Lost in their reverence to the power and rage they didn’t even witness the effect on their sons and daughters, servants and slaves. From the security of their Ever Realm they never even looked out, never saw their children wither and die in the raging storms spawned of their vile corruption. Instead, they luxuriated in their splendour and slept the sleep of Kings and Queens. And time passed. Decades. Centuries. And more. What has happened to Ambra has happened before – cycles within cycles, wheels within wheels. When the people of Ambria arrived at the settlement, they set these terrible events in motion – and, in time, Ambra’s mask slipped. Who tipped the balance remains an open question? Was it someone within Ordo Septimus attempting to create a gateway home within the confines of the town? Was it Seekers meddling in the ruined catacombs that lie below Ambra, just as they have meddled in the underworld beneath Davokar and drawn bloody retribution? Was it members of the Solstrålar Sect intent on harnessing lost lore to rekindle the flame of their dying god? For the moment, the truth remains unclear, lost in the raging howls of the ever-present storm.